It’s the ongoing job seeker’s dilemma: how to stand out in your job search and not get lost in the virtual pile of applications. The average number of applicants for a typical job opening is around 120, 20% of which will actually get called in for the interview. The best way to increase your chances of being one of the potentially lucky 25 is to put together a really solid application that stands up against (and ideally, above) the competition. “Resume? Check. Cover letter? Check. Introduction letter? Check.” Excellent – you know how to put together a basic application when applying to the job. Now let’s make it better. Think of it in terms of the bare minimum requirements, and then the finer details that truly make it polished, streamlined and effective. The bare minimum is what’s essentially required for consideration – your resume, in most cases a cover letter, and some kind of communication vehicle, say email or direct application web form, to get it to the right party. You can guarantee it will arrive on their digital doorstep, but not that it will read. 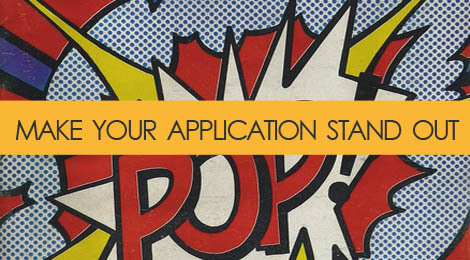 So what else can you do to truly polish your job application. and position yourself to really stand out in a sea of bare minimums? Never send an email application with a one line message saying “Greetings – I’m submitting my application for X job. Thank you,” or something of the like. The body of that initial email which you use to submit your resume and cover letter is prime real estate, and your only chance to make a short, but effective first impression. So use that to pre-qualify and sell yourself by 1) introducing yourself, 2) stating which job you are applying for (chances are they’re advertising several), and 3) providing a brief summary, 3-4 sentences, on why you’re a good fit for the job and what skills and qualifications you bring to the table. The idea is to compel them to continue reading your documents. In most cases, when a job is listed on a company website or other online platform, there isn’t a personal contact attached. Before you hit send, cross-reference the job on LinkedIn to see if it has been posted either in a group or on LinkedIn’s own job board, as many jobs posted on LinkedIn are attached to a direct contact. If there is one, you can apply directly through LinkedIn to ensure it gets to the right person, and at the very least you now have a name to personalize your communications, which shows you did your homework. You’d be surprised how many people don’t even take the time to configure their email settings to look professional. Make sure your email account is set up so that the “From:” field always displays your full time instead of your email address. Additionally, take a few minutes to set up a professional looking email signature for outgoing messages that includes your name, phone and email contact info, your website or blog if it’s relevant, and a phrase that describes your area of specialization or job title. It’s a passive way to tell your contacts and potential employers what you do, and potentially open doors in the process. You can also opt to include social media profiles such as LinkedIn if appropriate. Dana Leavy-Detrick – Award-Winning Designer With 8+ Years Pharma Experience. Before I’ve even looked at your resume, I know that you’re good at what you do (you’ve won awards), you have the experience level I’m requiring (8+ years), and your experience is targeted to the type of client/customer/account this particular job will be dealing with (pharmaceutical experience). You just got me to open your email. This sounds like a no brainer, but many people miss the mark on this one. Tailoring your cover letter to the job isn’t just about reiterating the relevant skill sets they’re looking for. The cover letter should make the connection between your skill-based qualifications from your resume, and your personal and professional interests in that particular company, job or industry. Do you identify strongly with the values of the organization, or admire the recent press they’ve gotten over a particular new produce? Discuss how those things impacted your decision to apply for the role, and how combined with your experience, you’re a great fit for the role! Convey genuine interest, and show them that you’ve done your research. Tags: career, communication, cover letters, job search, looking professional, marketing, professionalism, shameless self promotion. Bookmark the permalink. Will Having a LinkedIn Presence Really Make a Difference in My Job Search?